These “specific crystalline vectors” now forming Thoth is calling the phi gematrix cones or PGC for short. The PGC develop as cones within cones within cones. Each complex of cones spins together, releasing it’s combined radiance out into the planet. They will fine-tune their spin to match the seeded Amaru crystal locations on the earth, and in turn these seeded nodes will be activated to send ‘signals’ back to the PGC. This will allow communication of earth grid movement and changes to a more specific degree of correlation and “grid-speak” between all earth grid / matrices. Inside the cones within cones, will be created some personal crystalline cones, ones face-matching (locking onto the faceted planes) of etheric phi crystalline geometry within the DNA of the individual. This allows the individual to become part of the whole spinning, pulsing, building process in a more definitive way. I say “more definitive,” as of course, we are ALL part of it ALL anyway! However, the Amatrix Angels and the Zohar Mages are orchestrating these processes so that a larger number of humans can with greater ease, enter and process within the New Earth Star Hologram we are all creating together: both the humans, animals and the “Living Lights” of the cosmos. 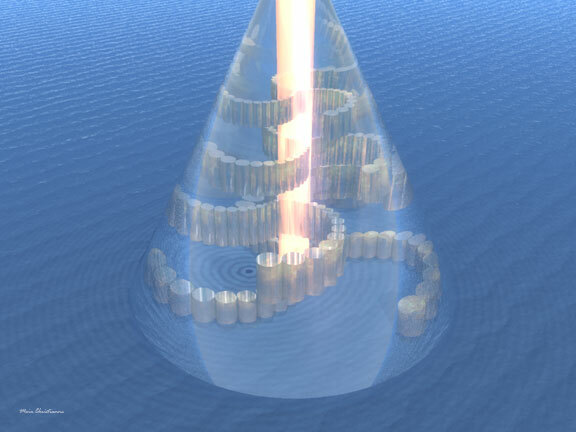 The phi gematrix cones align their phi crystals in helix formations, which trigger responses not only in our DNA but in the hagia of the earth - thus, the entire morphogenic field of the earth’s DNA. In the image above I have attempted to portray a facsimile of a phi gematrix cone. It does not show cones within cones - this is just an idea of the dynamic. The cone unfolds and folds with many helix-like layers, each layers slightly out-of-sync in it's unfolding and folding with the next - all moving in accordance to a pre-disposed rhythm dictated by the phi geometries of it's overall matrix. 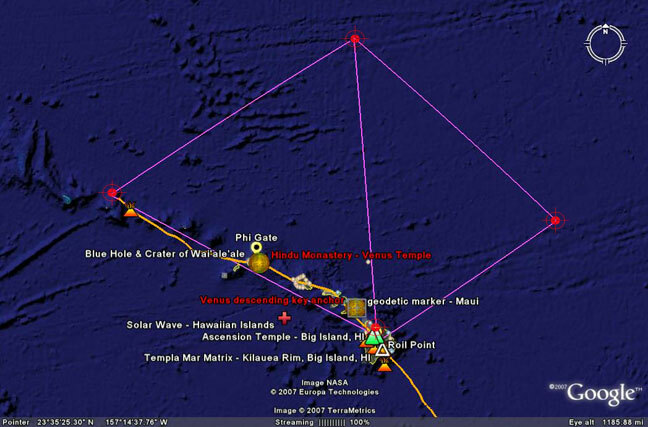 In the Google Earth diagram below, you can see the approximate physical area of the Maiden grid (pink), with the FireGem matrix path down the Hawaiian Islands in orange. If you switch to "sky view" in Google Earth while in the earth position of the Maiden grid (and the roil point, phi gate - the entire FireGem matrix of Hawai'i), you will see the stellar configurations in the sky above the Maiden grid at the time of the inception of the PGC - September of 2007 (see below). 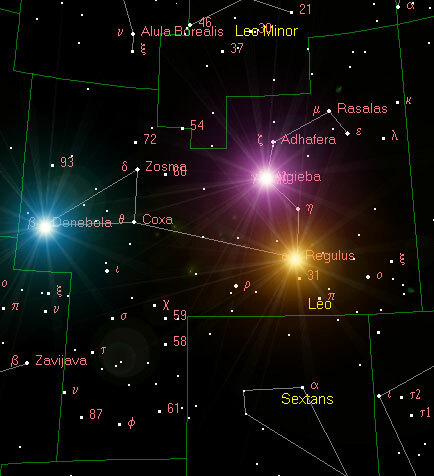 Of course, Leo is always present over Hawai'i this time of year, but the cones forming in this particular stellar window, funneling through the Lion's Gate from our "future" Golden Star Mazuriel in the Attasic Universe, I find most appropriate. 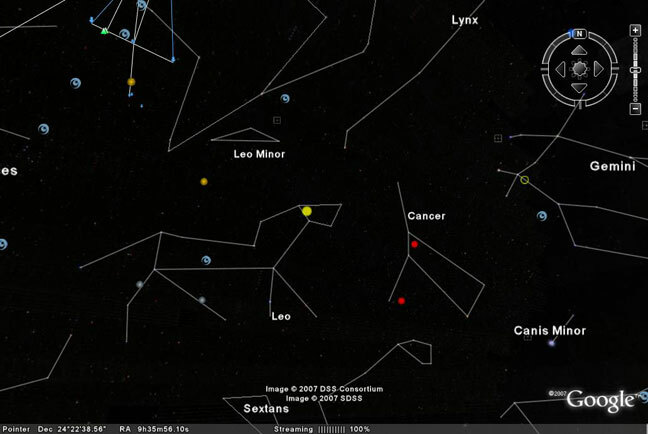 What Thoth calls the "Lion’s Gate" is in our constellation of Leo. It is composed of three of it’s stars” Denebola, Regulus (the lion’s heart) and Algieba (a binary system consisting of two stars). What better location for the phi gematrix cones inception, which are fine-tuning our DNA communication with the earth and the New Earth Star / Numis'OM and beyond - to the very edge of the Attasic universe! These are conic fields which are forming and re-forming (through unfolding and folding) as they communicate with our crystalline DNA. 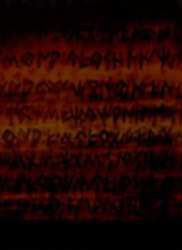 Whether we are aware of this or not, if we practice spiritual awareness to a specific "watermark" or degree of being, then our PGC are re-defining quickly, transmophing and connecting us ever deeper into the morphogenic field of the New Earth Star Hologram. 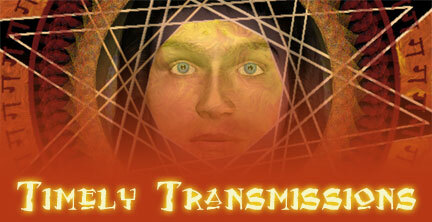 It is the PGC that are initializing the course of transmutation of our body vehicle into Pure Gem merkabahs.